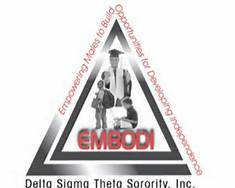 The EMBODI program is designed to refocus the efforts of Delta Sigma Theta Sorority, Inc. on the plight of African-American males. Data suggests that the vast majority of African-American males continue to be in crisis and are not reaching their fullest potential educationally, socially and emotionally. EMBODI is designed to address these issues through focus on STEM education, culture, self-efficacy, leadership, physical and mental health, healthy lifestyle choices, character, ethics, relationships, college readiness, fiscal management, civic engagement and service learning. The Southfield Alumnae Chapter’s EMBODI program serves males aged 11 – 17. The program year typically begins with a parent(s) meeting and mix and mingle for the young men in September. Sessions are held twice per month. The chapter partners with the men of Alpha Phi Alpha Fraternity, Inc. and Omega Psi Phi Fraternity, Inc. to facilitate achieving the goals of the program. Sessions held have included College Readiness/Money Smart, a goal setting session entitled Focused, Faithful, and Fearless, and open topic discussions. The young men of EMBODI participate in various community service projects including work at a homeless shelter, caroling at facilities for senior citizens, and health fairs. The year ends with an annual Boys to Men Forum. An informational meeting is typically held in September of each year. For additional information, please contact EMBODI@deltasac.org.